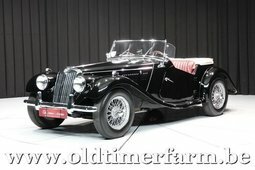 Early original left-hand drive MG TF with odometer in kilometers. The car has its original Almond Green metallic paint and its original 1250 cc engine. The car drives and stop as is should and is in great mechanical condition. The car belonged to Danish actor Ebbe Langberg in the 1960’s and later the editor of the Danish newspaper BT Morten Petersen. 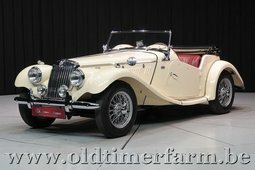 The MG TF, launched 15 October 1953, was a facelifted MG TD, fitted with the MG TD Mark II engine, headlights faired into the fenders, a sloping radiator grille concealing a separate radiator, and a new pressurized cooling system along with a simulated external radiator cap. The XPAG engine's compression ratio had been increased to 8.1:1 and extra-large valves with stronger valve springs and larger carburetors increased output to 57.5 bhp at 5,500 rpm. In mid-1954 the engine capacity was increased by 17 per cent to 1466 cc and designated XPEG. The bore was increased to 72 mm (2.8 in) and compression raised to 8.3:1 giving 63 bhp (47 kW) at 5,000 rpm and a 17 per cent increase in torque. The car was now designated TF1500, and externally distinguished by a cream background enamel nameplate on both sides of the bonnet, placed just to the rear of the forward bonnet-release buttons. Production ended at chassis number TF10100 on 4 April 1955 after 9,602 TFs had been manufactured, including two prototypes and 3,400 TF1500s. The TF was superseded by the MGA.